CORRELATION IS THE MATCHING OF ROCK LAYERS FROM ONE AREA TO ANOTHER. For example, a geologist might wish to know if a layer of limestone in NY is the same layer of limestone found in MI. Correlation can be useful because valuable minerals can be found in specific layers of rock, and if we can identify the same layer far away we might be able to exploit the resource over a large area. How Do We Correlate Rock Layers? Correlation by similarities is valid only over small distances. Even in small areas, correlations might be incorrect because similar rocks may form in similar environments millions of years apart, so THIS IS THE LEAST ACCURATE WAY TO CORRELATE ROCKS. The white layer of volcanic ash shown is an ideal key bed because it is distinctive and easy to recognize. In large volcanic eruptions ash is scattered over large areas of the Earth’s surface. The scattered ash eventually settles to Earth and is trapped among sediments. Because volcanic ash has a unique chemical composition for each eruption, specific deposits can be detected in rock layers. These volcanic ash deposits serve as age markers that can be used to match up rocks. Meteorite impacts result in a similar scattering of unique ash so they dating by Meteorite Deposits works in the same way. These unique layers of Volcanic Ash or Meteorite Debris that can be used to correlate rocks are called Key Beds. KEY BEDS ARE DISTINCTIVE LAYERS OF ROCK THAT FORMED OVER A WIDESPREAD AREA, IN A VERY BRIEF PERIOD OF TIME. THE BEST KEY BEDS ARE MADE OF VOLCANIC ASH OR DEBRIS FROM METEORITE IMPACTS. Because animals evolve over time, some fossils are typical of a particular time in the Earth’s history. These fossils are very useful for us because we can use them to date the layers of rock that they are found in. Fossils that can be used in this way are called index fossils, and rock layers with the same index fossils in them can be correlated. INDEX FOSSILS ARE FOSSILS OR ORGANISMS THAT LIVED OVER A VERY LARGE AREA, BUT LIVED FOR A VERY SHORT TIME. 1. The fossilized organism must be easily recognizable. It must be easy to ID and look unique. 2. The fossils have to be geographically widespread, or found over large areas so that we can use them to match layers separated by huge distances. 3. The fossil must have lived for only a short time, so that it appears in only horizontal layer of sedimentary rocks. Often you will be required to use these characteristics to decide which fossils in rock outcrops can be used as index fossils. For Example: The diagram below shows several rock outcrops separated by large distances. In each outcrop are several fossils. Which of the fossils shown is an index fossil? Easily Recognizable is usually not an issue in these problems because the diagram clearly illustrates each fossil. 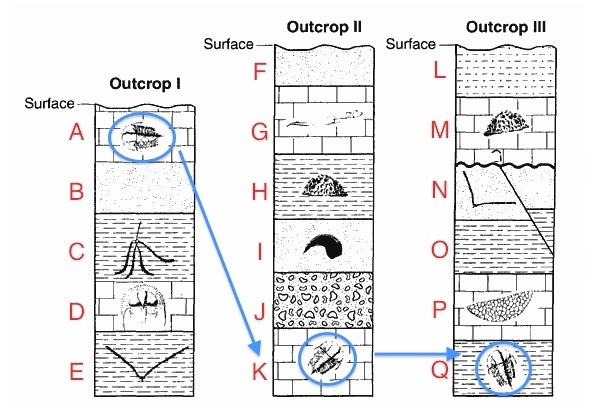 Widespread = The fossil must show up in each of the different outcrops (columns). 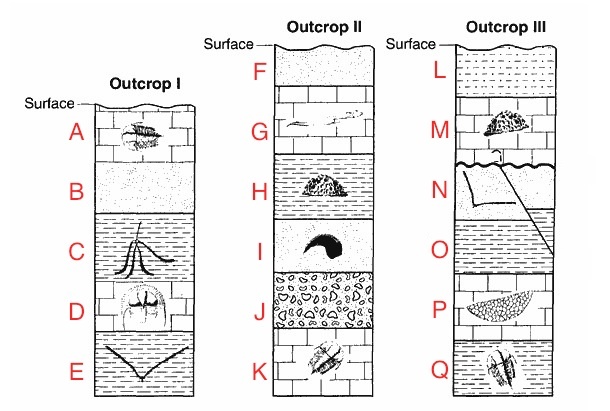 Short Lived = Within each outcrop, the fossil can only appear in one layer (row). o find the index fossil we eliminate any fossils that don't show up in each column, and fossils that appear in more than one layer per column. Can be eliminated because it shows up in two different layers in the first outcrop. Therefore we can eliminate all of these from the diagram. Can be eliminated because it shows up in two different layers in the second outcrop. Can be eliminated because it is not in the first, second, or third outcrops. We can use index fossils and key beds to correlate, or match rock layers that are the same age. By doing this we can then place other layers of rocks in order of their relative ages to find the oldest and youngest rocks in a series of outcrops. For Example: Examine the outcrop below and determine which layers are the oldest and youngest. 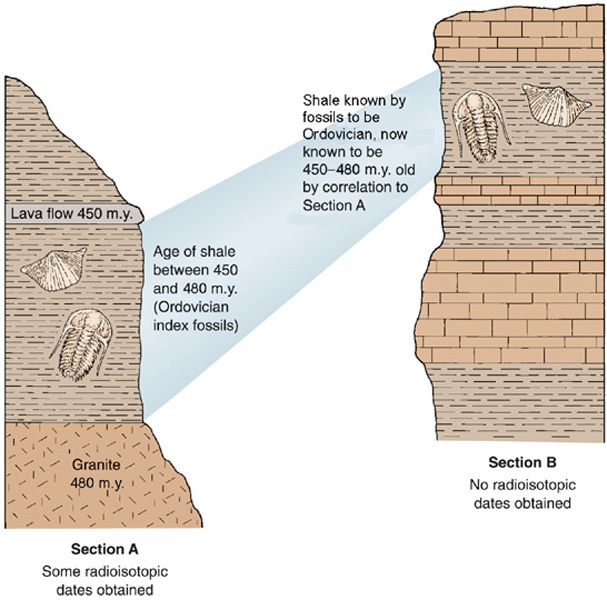 To find the oldest and youngest layers in the entire diagram, we first have to correlate the three outcrops. We can do this by using the trilobite index fossil, because it appears in all three outcrops. By correlating them, we now know that layers A, K, and Q are the same age. So to find the oldest rocks we look below them, and to find the youngest rocks we look above them. If we create a chart building our way up and down by looking directly above and below each layer we will find the top and bottom.